My Life as Jane: Technorati is not speaking to me. A drama. So last weekend, I explained how I was getting uncontrolled spam from Technorati to the tune of one email every 2 minutes for 3 days. 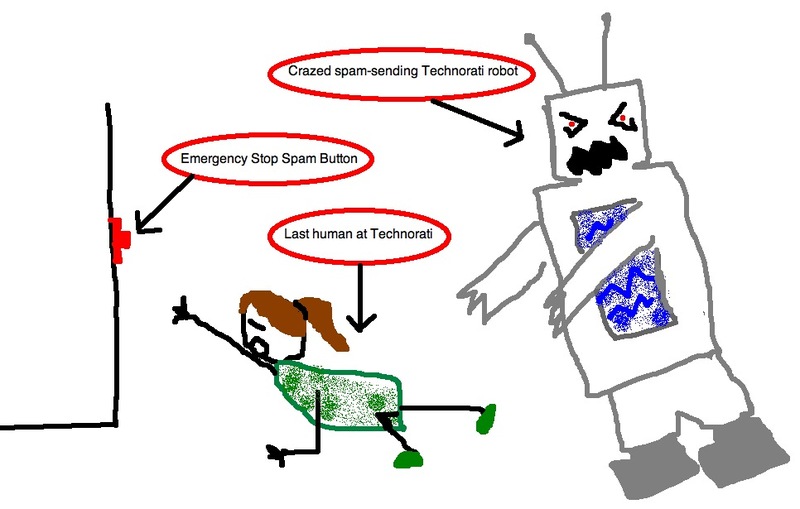 I posted my plea to Technorati to please stop sending me love spam on their "support" site which actually is only sort of associated with Technorati and is ironically called GetSatisfaction.com. I would like to wrap up this little relationship melodrama by reporting that, alas, Technorati is giving me the silent treatment and behaving like a scorned ex-lover. I've had some time to think through the tragic end to our relationship now and I think I know what happened. OK...so after my first plea on GetSatisfaction.com, a girl tech-y type person, who goes by the name "juicypeanut", answered and said something to the effect of "I'M ON IT!". That was Friday. On Saturday, this same peanut person came back and promised something to the effect of "OH YAH....we are SO on it...eventually!". And the emails kept coming. On Monday morning the emails stopped. This ALL actually gels with my original theory that Technorati has been taken over by robots and this small girl tech-y type peanut person was being held in the Technorati dungeon with the sacrificial goats. This peanut girl saw my plea and WANTED to help me. I know this because she said so. The stalker Technorati robots were obviously hurt when I spurned their stalker emails and forgot to send them a sacrificial goat when I asked them to claim my blog and took out their robot angst on peanut girl (who is obviously the last human being at Technorati) by throwing her in the dungeon. So she asked the robot dungeon guard if she could pee. The robot guard was confused by this "pee" thing and said "whatever" and let her out of the goat dungeon. Peanut ran to the nearest computer and posted her promise to me that the EMAILS WERE GOING TO STOP and she...(I'm getting emotional now)...APOLOGIZED for the inconvenience. So noble, this peanut girl. Of course the robots discovered her clever ruse and threw her back in with the goats. And that's when she saw it. The emergency Stop Spam button... partially obscured on the wall outside of the dungeon. All she knew was that she had to save Jane from the crazy stalker Technorati robot emails. So early Monday morning, in the ultimate disregard for personal safety, she distracted the robot guard with the clever "hey, your fly is down" line and bolted for the Stop Spam button. I didn't have room to draw the goats. And then the spam stopped. I haven't heard from juicypeanut girl since. Or Technorati for that matter. I think juicypeanut girl is probably dead and the Technorati robots have been scooped up by the Arizona police because they looked "foreign". I clearly need to get something better to do on a Friday night. This post is the most effin' hilarious thing I've read in a long time. I love how the whole Technorati ordeal took on a life of its own. I shall mourn Ms PeanutGirl... The evil robot overlords must be overthrown! Another explanation is that Technorati is Italian... just look at their name... and their IT folks are like their car builders. They put together mean, fast stuff. but it only works for a little while before it breaks and nobody really knows how to fix it. Poor goats, but I'm glad the spam stopped. So damn funny! You are totally insane! How did you come up with that? I don't think the police will ever be able to find the peanut girl one, I think one of the goats ate her. She is so gone.